Bill Clinton made a trip through Puerto Rico on behalf of his wife Hillary Clinton. He gave speeches and worked with leading Puerto Rican Democrats to try and get his wife elected for president. There are of course two major questions that come to mind in this. First, why would Bill Clinton go to Puerto Rico of all places? Puerto Ricans cannot vote in the November presidential elections. Second, Puerto Rico does not have the major electoral votes needed to elect a presidential hopeful in even a primary. One should not under-estimate the importance of Puerto Rico. In a hotly contested presidential primary as this, EVERY state and territory vote counts. Puerto Ricans can vote in the primaries, and this presidential election has become one of the most important in history. But this election goes well beyond just Puerto Rico itself. By going to Puerto Rico, Bill Clinton is trying to accomplish two things. 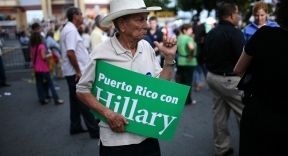 First, if Hillary Clinton wins, a new Clinton-led White House will look more favorably on Puerto Rico and Puerto Ricans and their issues and desires than a Donald Trump-led White House would. Equally important, there are many, many Puerto Ricans in the United States who can vote in the November presidential election. Their votes will count, and in a possible swing state like Florida where the Democrats really need the votes, this could work in their favor. Many Puerto Ricans live in Florida. Will this strategy work? Unknown. The one thing that seems to be clear is that the Donald Trump camp does not seem to be interested in gaining votes with Puerto Ricans and with Latinos in general. In an election this tight and this close, it makes absolutely no sense to alienate any significant voting group. And Latinos are an important voting group—this was proven by the 2012 election. It may indeed prove to be the case in 2016.